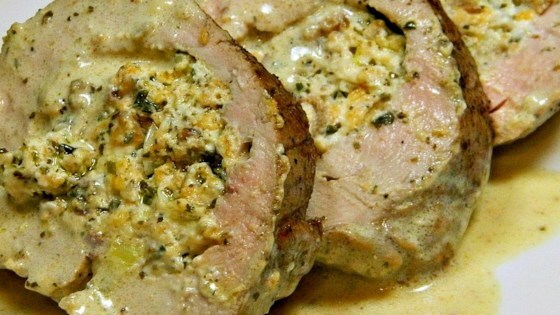 "Pork tenderloin is rolled around a pesto, Cheddar cheese, and cream cheese filling. It is browned then baked for a flavorful main dish. Cream sauce is added before serving. Delicious." Mix cream cheese, Cheddar cheese, bacon, green onions, pesto sauce, garlic, and parsley together in a bowl. Lay pork tenderloin on a flat work surface and spread cheese mixture on one side of the meat. Roll tenderloin around the filling like a jellyroll. Season meat with salt and black pepper. Melt butter in a large skillet over medium-high heat. Place rolled pork tenderloin in hot butter and cook, turning, until browned on all sides, 7 to 10 minutes. Transfer tenderloin to the prepared baking dish, reserving drippings in skillet. Bake in the preheated oven until pork is no longer pink in the center, about 1 1/2 hours. An instant-read thermometer inserted into the center should read at least 145 degrees F (63 degrees C). Place the skillet with reserved drippings over medium-high heat. Pour in white wine and bouillon, bring to a simmer, reduce heat to low, and add cream; stir until sauce thickens slightly, about 5 minutes. Pour sauce over tenderloin.